I always wonder what the hell did he do to some of our fans? Our best and most reliable defender for years, and yet many don't like him for some reason. Should have given a penalty away. I assume he is looking at the piece of defending early in the game(after his initial mistake) when he got back and had to hold off Mitrovic. Both players wrestling each other to establish position, as defenders and strikers have done for generations but because Smalling has a reputation for being handsy it must be a pen. Yea, I knew this all along, was just being mischievous. It was never a pen, in fact, more often than not, a foul will be awarded in favour of the defender. How many has he given away for grappling in his career? One? Always been that comment that when VAR comes in he will be screwed, but I doubt it. I would expect there to be an initial World Cup style deluge of pens at set pieces as officials overreact to slow mo of everyday clashes but then it will settle. Unless Fifa want football to go the way of US sports and basically outlaw defensive play that is. 'Smalling not involved'. People on here still believe we are better with him in the team. In the style of football we play every player needs to be good on the ball. Against better opposition if there is one weak link it leaves us exposed. Nowhere near United standard on the ball. Its like playing with 10men in possession. An excellent example of why we shouldn't go by stats. "Smalling not involved"
“Fulham being better than the scoreline suggests” does a bit of a disservice to the statistics you’re using to back up your point. Smalling was involved. He was involved because he won just about every header into the box. Against a player in Mitrovic who might just be the biggest aerial forward presence in the league. Not involved my arse. What are you talking about? It is a matrix based of possession and passing between players. In terms of heading yes Smalling was involved. But in terms of attacking play like I said, he was not involved. It is like playing with 10men. Or are you now going to argue Smalling is good on the ball? Again in the way Ole has United set up every single player needs to be good on the ball. 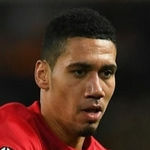 Against better opposition Smalling would be exposed. Not a United standard player. Why would Smalling be exposed against a better opposition, because he doesn't join the attack? I'm unsure why Smalling needs to be involved in attacking play. His passing isn't even as bad as some make out either. There will be games at home when it'll be more useful for both central defenders to carry the ball but there'll be more when it's not needed as much. That is the same twitter which posted the stupid Andreas stats which were blatantly incorrect so why should their stats accuracy be taken seriously? Well you’re going to ignore the rest of the game so why not? He completed plenty of passes, and more importantly, completed plenty of defending. He is judged on that first and foremost, not whether he ‘joined the attack’. Ffs, imagine laying into your centre because he didn’t join the attack! Your assessment of the game is absolutely absurd, I’m sorry. To say that due to Smalling, we practically played with 10 men is ridiculous. Not enough goals and assists perhaps? Good game (except first 10-15 min). Deserves more game time. Will never be world class but he's a very good defender, dominant in the air and quick. That hoof ball to Mata though! Thats completely false. Smalling is perfectly capable of passing his way out of the defense. Sure he doesn't drive with the ball and enter the opposition's half with dominant interceptions but that's not the same thing. I've seen him press just fine and make basic passes just fine too. I don't need stats to tell me he's "not involved". The inference is ridiculous. Those stats are not only laughable but questionable, it makes it out he never even made a pass to our players that resulted in some kind of attacking phase. He made one obvious forward pass right into the opposing half in the first half, like how can they forget that? I think it was intentional. Besides, he's a centreback for godsake, he's not meant to join the attack. HE'S A DEFENDER. He was pressed a lot today, he got the ball away quite well. In on instance he dribbled the ball out, drew the man towards him and slipped it to Mata. Aother instance his first touch took the ball beyond his opponent and he played it forwards to Dalot. His overall play was decent today, but since he is a defender he should be judged first and foremost on defending, and he handled Mitrovic better than anyone else in the squad could have done, especially has he's been out for a number of weeks. It's bizarre that even when he plays well, there is still some obtuse reason he needs to be slated. Bailly has received praise for much worse performances. Both players have very different barometers of what is deemed to be good, and Bailly's is much lower. It's like Smalling is Pogba, and half the Caf is Souness. He could make a hat trick of goal line clearances and win every duel that comes his way, but one mishit clearance would cancel it all out. It's the same twitter that claimed Andreas never gained back possession despite the fact that anyone who watched the game clearly saw he did. The tweet deserves no more recognition than a random post on here spewing out stats or "matrixes" without back up. On the flip side, he made the most clearances, won more aerial duels than everyone except Lukaku, and had the second highest pass completion percentage out of all of our players today (Mata was first). Rusty but okay. Smalling-Lindelöf should be our first choice pairing for the rest of the season. Numbers without context is just numbers. For his first match back since who knows when against Mitrovic and swirling wind, he's done really well. Along with Jones. I was disappointed that his pineapple bun didn't fall off. If you are referring to that incident with Mitrovic, no way. If the referee was giving anything it should have been foul on Chris. Shaky start but got a lot better, Mitrovic couldn’t do anything. I trust him over Bailly and Jones but the latter 2 have had more match intensity. All Ole has done since coming in, surely getting us to the point where we could argue the merits of 4 of our centre-backs for starting is one of his greatest achievements! Bit shaky at the start but grew into the game. Defensively solid for most of the game. Dealt with Mitrovic no problem. Glad to have him back in such a time where games are coming thick and fast. Needs to get up and running in a hurry. We're going to need him for the rest of the season. Easily the best defender at the club. He's played in a side that passed out from the back better and more than this side and did well. No need to worry about him now. For me Smalling and Lindelof is the best centre-back pairing we've got. Smalling passes fine? He lines up like he is taking a Roberto Carlos style freekick to make a 10 yard side pass but okay. Well see how often he plays under OGS who demands passing ability from his CBs. Posts like this make me laugh when OGS has played Jones most games. There is almost zero difference between the two on their on the ball ability, if anything Smalling is less prone to errors on the ball because he generally plays it safe. Oh and one is a 10 times better defender than the other. Jones and Smalling are like a galaxy apart when it comes to ball-playing abilities. Must have missed all of Jones amazing build up from the back, pinging cross field passes and breaking the lines. Any examples? No, he just passes to the closet man usually like Smalling. So explain this? He’s involved there. I don't like him and I hate the fact he's our best defender as I think you win nothing important if that's the case. However, he has consistently been our best defender and in the past when I've wrote him off he's come back with a strong performance. Thought he did well coming back into the team and he handled Mitrovic well. Despite what I think of him he will be an important player for the remainder of the season. Sounds like you should probably change what you think of him. Based on this post you seem to say that your dislike for him has no real valid reason. Back then in traditional game, defenders also use their hand on opposition players. Players just need to know when they need to use them and in what angle so the referee and linesman won’t be able to see the action.